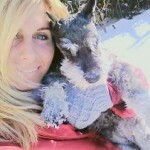 This entry was posted in Pet of the Month and tagged arthritis, Cushings, dog, dog walking, donna, new jersey, nj pet sitters, north jersey, pet sitting, rutherford, schnauzer, traci, vertigo by njpetsit. Bookmark the permalink. I am so pleased that Traci was selected at Pet of the Month! Thanks you so much! NJ Petsitters is great!